Courses offered in the state of New York will contain additional content specific to the laws and regulations of the state, and this information will be included on the final exam. If you work in the state of New York, your crematory operator certificate will be issued by the New York Division of Cemeteries. 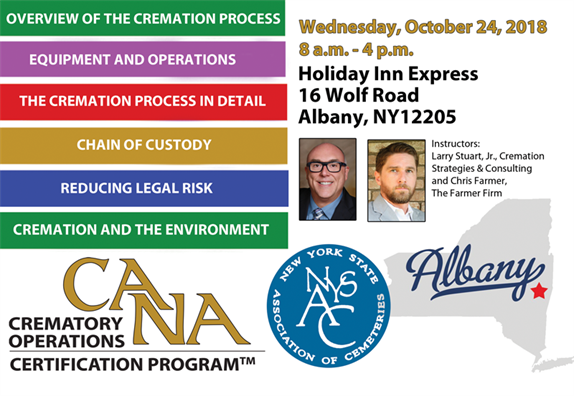 Attendees who do not work in the state of New York will receive their crematory operator certificate from CANA. $495 All registrants Click here to print a registration form if you do not wish to register online. Register by submitting these items via email to jennifer@cremationassociation.org. Please give at least one (1) business day for processing. Call 312-245-1077 for assistance.